Setup was incredibly easy – to the point it would be fair to say. . there isn’t any setup required. You put in the battery, power on both units – and bingo you’re up and running. However it is worth a read through the manual to make sure you’re happy with the settings (including setting gain through the actual receiver). The big sell on this for me though – wireless is great, but is digital going to be better? Worse? Well better is the simple answer. It runs on the same frequency as wireless networks – so I was worried that many pubs with wireless networks, people on phones etc would cause issues. However not a single problem to date. The actual receiver sets up 3 connections to the mic and is constantly checking the stability of them. If there are issues it just changes channels automatically. With the signal being sent on 3 channels at any time, if there was a problem with one channel it would use the signal from another. So for overall quality of the wireless function – it is great again. No issues, no interference . . .just a nice clean crisp signal. Range wise – well I’ve probably only going about 20-30M away from the receiver to date, and no drop outs. Sound quality next. Again – a big thing when doing live vocals is clarity. The SM58 has served me well, moving to this I expected a small change – but not the massive difference that the entire band noticed. It was crystal clear, and just overall range felt and sounded SO much better. I was quite stunned by how good it was. . .and over wireless. So if you’re currently using the industry standard SM58 or even the B58 wired – this is a worthy change to go wireless to. Finally – battery life, a BIG factor in any wireless system. The Shure GLXD24UK/B58 has quite a small (and light) battery. Shure claim it will provide up to 17 hours function on a full charge – the actual receiver has a display showing you how long is left. In reality – it seems nearer to 16 hours but this is still probably a good 5 gigs worth. Charging is also VERY simple – you can either use the supplied USB cable that plugs into the microphone directly, or remove the battery and just slot it into the receiver. It will even rapid charge in 15 mins to give you over an hours worth of use! So in a worst case, while setting up it will charge enough to get through that first set! Overall – the whole package is excellent, easy to setup, great to use and the vocals sound great. 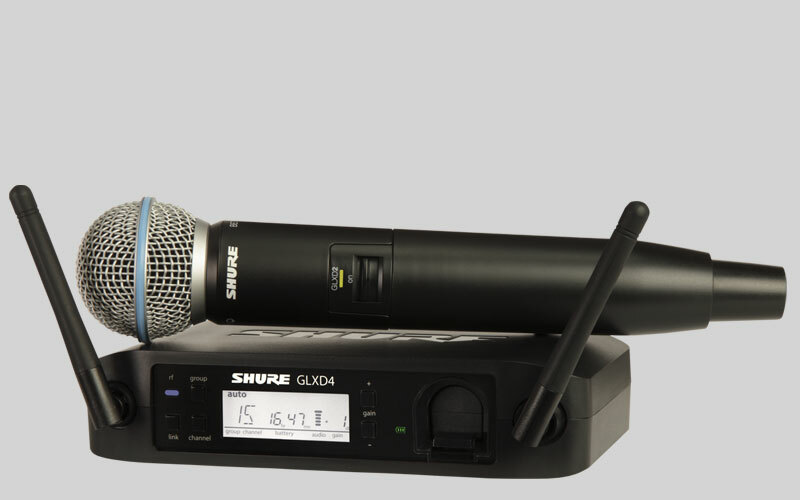 You can also get a free battery from Shure – which means you’ll always have one fully charged and ready to go. Many shops are offering this for around the £395 price tag – in my view it is very much value for money. Personally I purchased mine from GAK (http://www.gak.co.uk/en/shure-glxd24uk-b58/84882) after being sold one by Nevada as new – but unfortunately it was clearly the show model . . . and who wants to put there mouth around the microphone others have handled! Any questions – leave a comment, but I would not hesitate in recommending this mic for any serious singer.